﻿ Will Wideband Multimode Fiber be a new option for future data centers? Will Wideband Multimode Fiber be a new option for future data centers? Multimode fiber has evolved from OM1, OM2, OM3 to OM4 since entering the market in the 1980s. Among them, OM3 is for vertical cavity surface emitting laser (VCSEL) light source optimized multimode fiber, the effective mode bandwidth (EMB) reaches 2000MHZ. Km, which can support transmit distance up to 300 meters or 100 meters for 10GBASE-SR transceiver 100GBASE-SR10 transceiver respectively. OM4’s effective mode bandwidth (EMB) compared to OM3 is increased by more than 1 times to 4700MHZ.Km, but support 100GBase-SR10 transceiver is only 150 meters effective transmission distance, that is relative to the OM3 fiber, 100G Ethernet Network transmission distance increased by only 50%, obviously can not meet the needs of the future high-speed network. 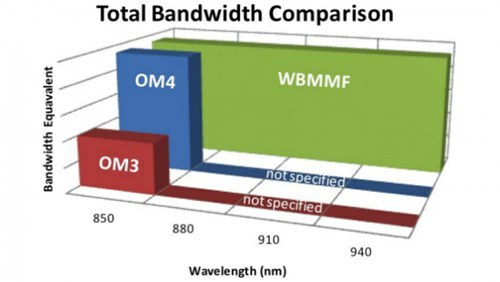 As one of the options for future data centers, Wideband Multimode Fiber (WBMMF) is far superior to traditional OM4 multimode fiber in efficient mode bandwidth (EMB), so it can provide enough margin space for high-speed Ethernet in future. Before understanding it, we need to carefully understand the development of single mode and multimode fiber. Single mode fiber is mainly used in multi-frequency data transmission applications, the transmission mode is usually used wavelength division multiplexing (WDM) transmission mode, after the multiplexing of optical signals only need to use a single mode fiber to achieve data transmission. The 100GBASE-LR4 released in 2010, using 2-core Single mode Fiber (1 transmit +1 receive) 1, can be in one core fiber simultaneously multiplexing 4 wavelengths, each wavelength transmits at 25Gbps. The transmission rate of single mode fiber is higher than that of multimode, and the transmission distance is 50 times higher than that of multimode, so its price is higher than MMF. Compared with MMF, the core diameter of single mode fiber is much smaller, and the characteristics of small core diameter and single mode transmission make the optical signal transmitted in SMF not distorted by the overlapping of light pulses. In all fiber types, the signal attenuation rate of single mode fiber is the lowest and the transmission speed is the most. However, single mode fiber needs to use a high-cost laser (LD) Light transmitter transceiver, single mode laser transceiver Price is at least more than 3 times than the multimode transceiver, the power consumption of at least twice times. Conventional multimode fiber generally uses serial transmission mode, in this mode, increasing the transmission rate of Ethernet must increase the transmission rate of each core fiber/channel. At present, the Ethernet maximum serial transmission rate is 10Gbps/channel, and IEEE is developing 25Gbps/Channel, 50Gbps/Channel Network standard. Take 400G Ethernet as an example, there will be 3 different versions like 25Gbps, 50Gbps, and 100Gbps, the fiber core number needs 32 cores/16 cores/8 cores respectively. 400G Ethernet uses NRZ, PAM4, DMT, and higher-level coding means more complex circuits and power consumption, and thus higher costs. In the past practical applications, the most common determinant of selecting multimode or single mode is distance. If only child miles are preferred multimode because the LED transmitter/receiver is much cheaper than a single mode laser. If the distance is greater than 5 miles, the single mode fiber is best. Another issue to consider is bandwidth; if future applications may include the transmission of large-bandwidth data signals, the single mode will be the best choice. In the 2010 years, with 100g-NG, 200G/400G Ethernet, and even 1T Ethernet, the traditional multimode fiber has become the bottleneck of the future Ethernet network, and the emergence of the WBMMF breaks the bottleneck of traditional multimode fiber. It draws on the wavelength division multiplexing (WDM) technology of single mode fiber, extends the range of available wavelengths in network transmission, and can support 4 wavelengths on one-core MMF, and reduces the number of fiber cores needed to 1/4. 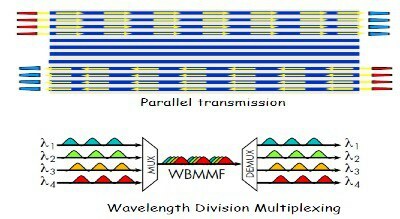 Shortwave Wavelength Division Multiplexing technology utilizes a high cost-effective vertical cavity surface emitting laser (VCSEL) light source, the optimized wideband multimode fiber (WBMMF) can support 4 wavelengths on one-core multimode fiber, reduce the number of fiber cores required to 1/4, and increase the effective mode bandwidth (EMB), so the 40 / 100G transmission distance extended to 300 meters. 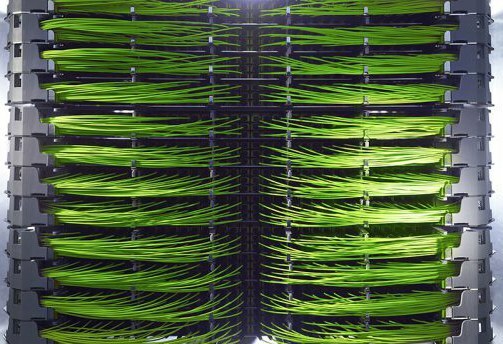 At present, 96% of the world’s data centers, the backbone of the network core (Spine) switch to the Server cabinet Branch (Leaf) switch within 300 meters, therefore, shortwave wavelength division multiplexing (SWDM) and wideband multimode fiber (WBMMF) will continue to be the tradition of multimode fiber as the mainstream transmission medium of data center 40G/100G/400G Ethernet. 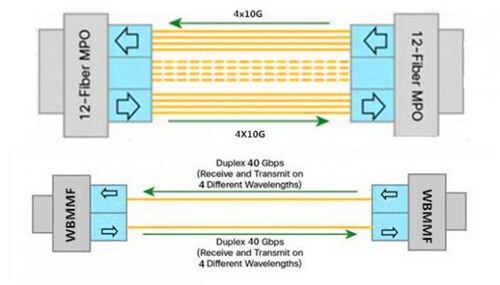 In the future, the combination of shortwave wavelength division multiplexing (SWDM) and parallel transmission technology requires only 8-core wideband multimode fiber (WBMMF) to support more high-speed applications such as 200G/400G Ethernet.